Now let's look at the third. 3. Why would God introduce such an obvious anomaly into the consistent biblical pattern of assigning miraculous gifts after baptism?2. Does Divine intervention always indicate salvation or can it simply indicate that God has employed someone or something through Divine validation? Why did God employ such an attention grabbing measure in this unique situation - because it was just that - unique. Not since Abraham, had the Gentile world been invited into the favor of God. For thousands of years, Gentiles had been looked down upon and rejected. This moment was not just about Cornelius' salvation; it was also about a very important pivotal point in history. God employed dramatic measures because He wanted everyone to know that it was He, not Peter or any other man, Who was validating this historical transition from "Jews Only!" to "Everyone Invited!" In order for that moment to be believed, the invitation required a direct intervention from God. Note: Even if a person were to argue that Cornelius was saved before baptism, and I do not, it would still need to be viewed as the exception to the rule, not the rule itself. Immaturity is often marked by a preoccupation with exceptions to the rule or a search for ways to get around the rule. Spiritual maturity, on the other hand, leads the faithful into full surrender to the whole counsel of God. In Acts 8:9-17, we find that it is equally possible to be saved, yet not be employed by God to do miracles. Next time, we will conclude this series with a very personal heartfelt confession entitled, "Satan has a very big 'But...'" Please join us then! 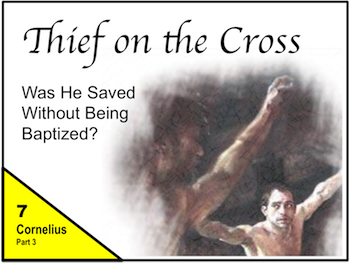 The Thief on the Cross: "Conclusion"